Cassie and Colton enjoy a date during "The Bachelor." Colton left Denver behind and racked up the frequent flyer miles as this week marked the iconic hometown dates. Ah the hometown dates episode. A refreshing take on humanity. A man dating four women flies around the country and meets the families in the most awkward settings possible. Oh yeah, and he has to ask all four father’s for the blessing to marry their daughters… that should go well! First up, Caelynn (but not before a Colton showering scene of course). Caelynn, who is Miss North Carolina, has her hometown date in Virginia. Riddle me that Batman. The two ride around Virginia in a horse drawn carriage as Caelynn so romantically points out her favorite spots in town like you know, her pediatrician’s office. Memories. The two then head to Caelynn’s home for a good old-fashioned Virginia BBQ, which includes a personal deep fryer. We learn that Caelynn’s biological father is not part of her life and her stepfather, John, is who Colton will need to ask for her hand in marriage. John questioned if they were really more than just friends, which is tough given the premise of the show. Next up, Hannah G. Colton heads to Alabama and the first activity he experiences is pure adrenaline… an etiquette class! There is seriously nothing more exciting to do for a national TV show than reenact “A League of Their Own?” There is no Forrest Gump museum or an iconic college football program? Lucky Colton. Hannah’s dad asked Colton straight up, “what are your intentions with my daughter, man?” Queue Colton’s panic. Colton then goes for the homerun in asking for his blessing. After telling Colton, “wow I never thought of this” (does he know the point of the show?) he finally gives in and Colton receives his blessing. For those keeping track at home, that’s two hometown dates and two blessings. Colton is batting 1.000 at this point. Can he go a perfect four for four? Tayshia’s hometown date is next up in Santa Ana, California. 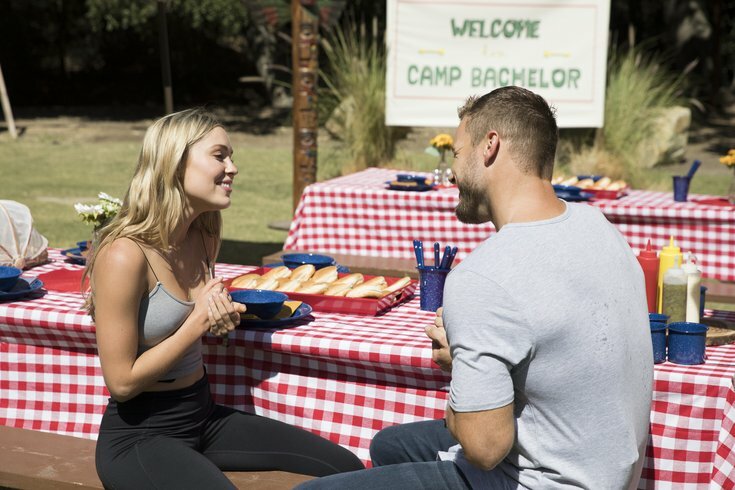 Tayshia blind folds Colton and takes him hostage (she makes a “Bird Box” joke, but more on that in an “Inside Look.”) They drive to an open field, where he learns he will be sky diving (as payback for making Tayshia go bungee jumping). Shockingly the two survive jumping out of the plane, and roll around in the grass upon landing for a steamy make out session. Time for dinner with her parents. Tayshia reminds Colton (for the 100th time) that her dad could be tough. We are also reminded (again for the 100th time) that Tayshia was married before, and the last man she brought home to her parents was her ex-husband. Colton then has a candid conversation with Tayshia’s brother. We learn her brother is an FBI agent in training, and that he will hunt Colton down if he hurts his sister. What a warm welcome to the family! Now for the main event: Colton asking Tayshia’s dad for his blessing. For the third time this episode, Colton asks for a father’s blessing. But this dad is a cool dad, and did not give in…at first. After standing his ground, Tayshia’s dad explains how he just met Colton and that things are moving way too fast. Could this be Colton’s first no of the night?! Not so fast. In a true heart-to-heart conversation, Tayshia’s dad tells her, “you don’t microwave relationships.” That line couldn’t be more perfect for “The Bachelor.” After a night of Ben Stiller and Robert De Niro-esq interrogations, Tayshia’s dad gives Colton his blessing in front of the entire family. Colton is now three for four heading into the bottom of the ninth. The show stays in state and travels to Huntingdon Beach for Cassie’s hometown date. After Cassie put on her best Kelly Slater impression by “teaching” Colton how to surf, it’s time America meets Mr. Randolph. While standing in Cassie’s living room, Colton thought it would be a good idea to start grinding with her in front of her entire family. This immediately rubbed Cassie’s dad the wrong way (pun most certainly intended). The flirting continued with hand holding, caressing and kissing, to the point where Cassie’s dad wasn’t having it. With a perfect three-for-three record on the line, Colton musters up the courage to ask Cassie’s dad for his blessing. And boy was he not having it… at all. Skeptical from the start, Cassie’s dad reminds Cassie that marriage is the most important thing that you have, and it’s not just something you jump into (or jump over a fence for). Colton leaves Huntingdon Beach an even worse surfer, and without the blessing from Cassie’s dad. Talk about a tough way to head into a rose ceremony. Next week marks the fantasy suites. And yes, there is still no jumping of the fence, which makes you question what will happen first; Colton jumps the fence or Bryce Harper signs with the Phillies. My money is on Bryce. And then there were three. •	During Tayshia’s date, she made a joke while blind folding Colton that this wasn’t the “Bird Box” challenge. Well “Bird Box” did not come out until November 12. As a reminder, contestants are put in solitary confinement while filming with no phones, Internet, etc. Also, Tayshia’s hometown date was filmed on October 31…before “Bird Box” came out. That means the show had Tayshia record this line at some point after filming to insert into the episode, most likely given the popularity that was the “Bird Box” challenge.